The 1913-14 Michigan Copper Strike and Italian Hall Book Project: The Book has Arrived! 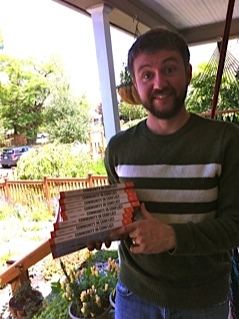 Eight copies of our book Community in Conflict arrived on my (Aaron's) doorstep today. As this photo shows, I was pretty happy about their arrival. The book was many years in the making, and this seems like a good time to extend our gratitude to everyone who made the book possible. We owe a special debt of gratitude to everyone at Michigan State University Press, and the anonymous readers who gave us valuable suggestions along the way. A final (and big) thank you to John Beck, Larry Lankton, Elizabeth Jameson, and Erik Nordberg who wrote very kind blurbs for the back of the book. It certainly feels good to be recognized by such a star-studded group of scholars.